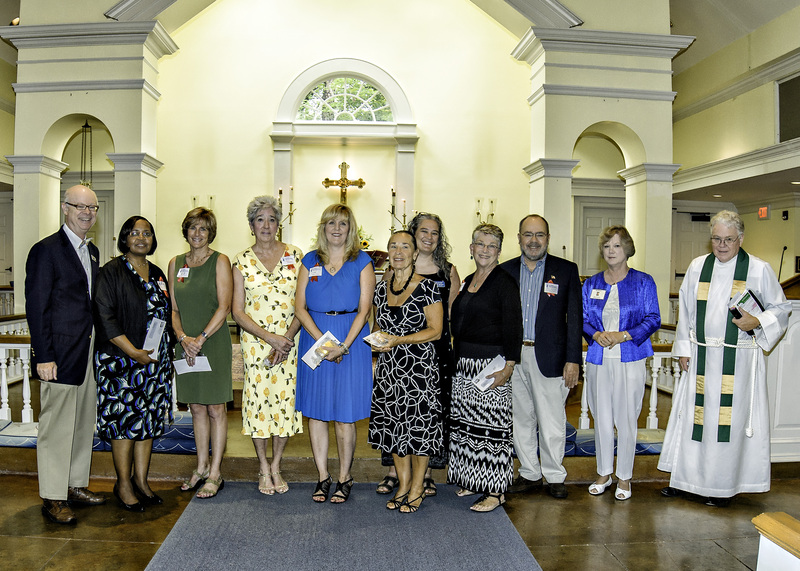 During the 10:15 a.m. church service at All Saints Episcopal Church on August 18, 2013, representatives of six local non-profit groups were presented funding grants of $4,300 each from the proceeds of the 26th Annual All Saints Garden Tour. The groups were: Bluffton Backpack Buddies, Hilton Head Backpack Buddies, Family Promise of Beaufort County, Literacy Volunteers of the Lowcountry, Neighborhood Outreach Connection, and Thumbs Up, Inc. Also in the photo are Fred Gebler, Chairperson for the 2013 All Saints Garden Tour; Karen Reuter, Chairperson for the 2014 All Saints Garden Tour; and The Rev. Richard C. Lindsey, Rector of All Saints Episcopal Church.